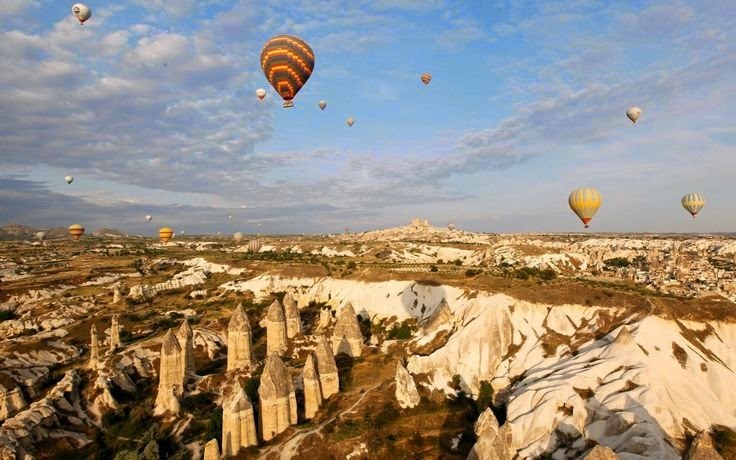 How to go to Cappadocia Nevsehir? What to eat in Cappadocia Nevsehir? Where to go in Cappadocia Nevsehir? What to do in Cappadocia Nevsehir? What to buy in Cappadocia Nevsehir? signs of thousand years old civilizations with carving houses and churches within these earth pillars and decorating them with frisks. During the Roman Emperor, Augustus period, territories of Cappadocian Region as a wide region lying till to the Toros Mountains at south, Aksaray at west, Malatya at east and Eastern Black Sea shores at north within the 17 volume book named 'Geographika' of Strabon, one of the Antic Period writers. Today's Cappadocian Region is the area covered by Nevşehir, Aksaray, Niğde, Kayseri, and Kırşehir cities. More limited area, rocky Cappadocian Region is composed of Üçhisar, Göreme, Avanos, Ürgüp, Derinkuyu, Kaymaklı, Ihlara and environment. Traditional Cappadocian houses and dovecotes carved into stones are showing the uniqueness of the region. These houses are constructed on the feet of the mountain via rocks or cut stones. Rock, which is the only construction material of the region, as it is very soft after quarry due to the structure of the region, can be easily processed but after contact with air it hardens and turns into a very strong construction material. Due to being plentiful and easy to process of the used material, regional unique masonry is developed and turned into an architectural tradition. Materials of neither courtyard nor house doors is wood. Upper parts of the doors built with arches are decorated with stylized ivy or rosette motifs. Dovecotes within the region are small structures constructed within 18th century and end of 19th century. Some of the dovecotes, which are important for showing Islamic picture art are constructed as monastery or church. Surfaces of dovecotes are decorated with rich inscriptions and adornments by regional artists.